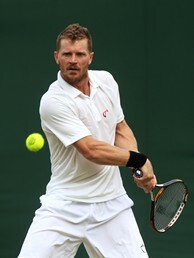 Alex Bogomolov Jr. has reached the third round of Wimbledon for the first time in his career. WIMBLEDON, England - Alex Bogomolov Jr. has not had an easy path to respectability, which is why reaching the third round of Wimbledon has him sky-high. On Wednesday, using some advice from Andy Murray, he thrashed No. 25 Juan Ignacio Chela 6-0, 6-3, 6-4 and now gets to face 2010 Wimbledon finalist Tomas Berdych on a show court. That's heady stuff for a guy who a few years ago was so distraught with his personal life that he couldn't keep his head in. "It was very tough and a lot of times to keep a level head and keep faith that once it's here it's surreal but yet I'm trying to take every opportunity," Bogomolov said. "It feels amazing." About five years ago, Bogomolov went through the ringer, as in 2005 he was banned for doping and had to serve a one-and-a-half month suspension for failing to file paperwork on the anti-asthma medication he was taking; he went through a painful divorce from fellow American player Ashley Harkleroad in 2006; and then in 2008 suffered a torn ligament in his left wrist, had to have surgery and saw himself drop out of the top 300. It's been a long and often hellacious road back to the top 100. "All those things personally took a tough hit on me but my family and friends told me it will come and just stay in there," said Bogomolov, who is now ranked a career high No. 72. "They way the divorce happened with tennis being such a small world, everyone knew what was going on. Then going back on tour and seeing the guys who are not your best friends out there and even if they are nice to you, you might play the same guy tomorrow and I felt like they had an edge on me." Bogomolov tested positive for salbutamol, but said he was taking it to treat the exercise-induced asthma he had had since the age of 12. However, at the time he did not have a valid Therapeutic Use Exemption to cover the treatment. But the tribunal found that there had been no intent to enhance performance, so he received a light suspension. "I was so bitter for a long time about it because two years later they made it legal not to file the proper paperwork for using the medication, but I lost a lot of money," he said. While Bogomolov was not pleased with how his brief marriage to Harkleroad ended, he did admit that they got married too young and that in the long run they both ended up happier. Harkleroad is now married to former U.S. touring pro Chuck Adams and just had her second child (a daughter), while Bogomolov and his fiancée, Luana, are the proud parents of an 18-month-old boy, Maddox. He and Luana are about to close on the purchase of a house in Boca Raton. "Everything definitely happened for a reason," he said. "We rushed into it and for me it was more of a prize when we got married because she was a prize." But last year his luck began to change when he hooked up with coach Yoav Schab, the former instructor of Israeli player Dudi Sela. He owed $40,000 on his credit cards and went to the Kennedy Foundation Funding Invitational tournament in New York. There, he struck gold. "The winner got $40,000 and I beat Mike Russell in the final and that jump started everything for us," he said. "I paid off everything right away." The son of a famous Russian teaching pro who moved to South Florida when he was 11, Bolgomolov Jr., his older sister Katia (a former All-American at the University of Miami) and his younger brother, Boris, had to make a number of adjustments when they moved stateside. Their father, Alex Sr., quickly grew tired of the lack of work ethic of the juniors whom he worked with in Florida and moved back to Russia in 2003. He's now running a summer tennis camp in the Ukraine. "I haven't seen him in three years, but it's tougher on my brother because he's a teenager and trying to go to college and to grow up without a male figure, so I had to be there," he said. [My father and I] speak on a good win basis, but we never speak after a loss." Bolgomolov began the year ranked No. 167, but qualified and reached the quarters of Zagreb, won the USTA Dallas Challenger, qualified for Miami and stunned No. 4 Andy Murray in the first round. "To play Andy on the center court where I grew up and to be that composed, I was shocked," he said. "I felt like I had been doing it for a while. It was my biggest win." Not every player peaks in their early 20s and it has taken Bogomolov until he’s 28 to show off his best stuff. He'll be the underdog against Berdych, but he'll go into the match with a lot of self-belief. That's what kept him in the sport and he's going to stick with a positive attitude. "I always had faith that everything would be good for my tennis and that I was born to do it," he said. "A lot of friends I have say I'm one of the most positive people they met and I rub off on them. Even when the times are really bad, I'm so optimistic and try to make good out of it. If I can be in the second week of Wimbledon, it will be a dream come true."